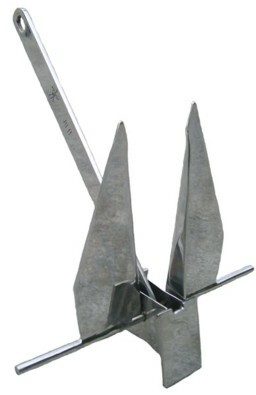 Blue Star is our featured brand of claw, folding, plow and wing anchors. Azure Marine stocks stainless steel versions of all Blue Star anchors (galvanized anchors are available for quantity orders). All Blue Star stainless steel anchors are made with 316 stainless steel, which is more resistant to corrosion than the less expensive "304" grade of stainless steel (some factories even mix 304 and 316 in the same product). 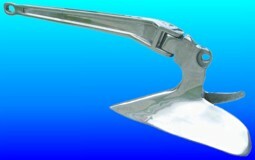 "Claw" Anchors are an excellent design, patterned on the "Bruce" anchor designed for North Sea use. They respond well to changes in current and wind, set and reset well, and work well in bow rollers. Always use your judgement and experience making your final choice. Many factors can influence anchoring in real world situations. These charts are guides only. 0lbs N/A 14 1/4" 7 1/4" 3/8" 9 1/2" 7 1/4"
0lbs 1/4" 18" 7 1/2" 5/8" 12" 9 1/2"
Based on the tried and true fluke or Danforth style anchor. Our solid stainless steel models are a great upgrade for boats already configured for this style anchor. s use your judgement and experience making your final choice. Many factors can influence anchoring in real world situations. These charts are guides only. 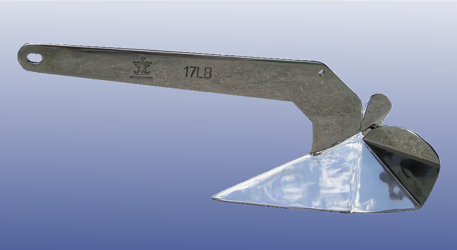 0lbs N/A 35 1/2" 16" 27" 3 3/4" 17"
0lbs N/A 41" 23" 31" 4 1/2" 20"
Folding Anchors are great, easy-to-store anchors for hand deployment. 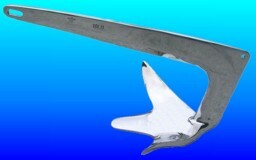 Our stainless steel models won't leave rust in the bottom of your Jetski, dinghy or boat. "Plow" Anchors are a versatile and popular style, similar to the "CQR" anchor. They offer very good holding power and an excellent response to changes in wind/current. A weighted toe helps them penetrate the seabed. Plow anchors are usually better than fluke anchors in rocky or grassy bottoms. Remember that the plow is on a pivot and on some boats may move when under way. 0lbs 5/16" 10" 27" 13 1/2" 2" 23"
0lbs 5/16" 10 1/2" 33 1/2" 18" 2" 26"
0lbs 5/16" 11 1/2" 33 1/2" 17 1/2" 2" 25 1/2"
0lbs 5/16" 12" 34 1/2" 18" 2 9/16" 29"
0lbs 5/16" 11 1/2" 31 1/2" 14 1/2" 2 1/16" 23"
0lbs 3/8" 12 1/2" 36" 15" 2 1/2" 24 1/2"
0lbs 3/8" 19" 48" 24" 2 7/8" 34"
"Wing" Anchors are strong, deep setting anchors, with a weighted toe to help penetrate the seabed. The flat surfaces make the stainless steel models really beautiful and the straight shank is compatible with a broad range of bow rollers. 8100lbs 1/4" 8 1/4" 22" 8 5/8" 9 9/16" 2 3/16"
13200lbs 5/16" 9" 24 3/8" 9 5/8" 11 3/16" 2 9/16"
13200lbs 5/16" 10 3/8" 27 1/2" 11" 11 7/8" 2 15/16"
13200lbs 5/16" 11 3/8" 29 7/8" 12 3/16" 13 3/16" 3 1/8"
18500lbs 3/8" 12 3/4" 32 1/4" 13 3/8" 14 5/16" 3 1/2"
18500lbs 3/8" 14 9/16" 38 9/16" 15 5/16" 17 3/16" 3 7/8"
0lbs 3/8" 16" 45" 19 1/2" 19 3/4" 4"